Awesome design, nice and light material. Cheap price in sale and not many people in the gym wearing these designs...yet! It's a fairly tight fit. I'm 6ft and 98kg with a belly and there's no slack around there and I got a Large. I've had other large items before like the performance gear which fits ME much better. However, that's me...nice length to it. White is fairly see through, I've got a big chest and my nips shine through the material brightly and almost peak out the sides sometimes but the material is fitted nicely around the ol' manboob *cough* PECS. I'll use it as motivation to get some more weight off! Any dark joggers or shorts and a Ben n Jerrys. Awesome new MP top with an edgy print - The quality has improved massively and the fit has also got better, I can even train chest in this. Ordered on the 23rd, arrived promptly on the 24th. As per normal, fantastic service from Myprotein. I honestly can't find a single flaw with the Geo Print Stringer Vest. The material is very comfortable against the skin (important for me since I have eczema), it dries quickly and it certainly looks the part. 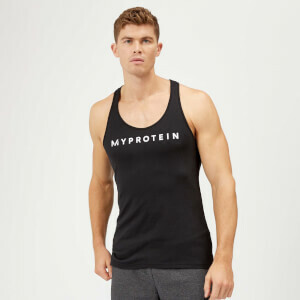 I've started doing allot more shoulder / back exercises, so I was looking for something that would keep me covered, yet enable me complete freedom of movement in my shoulders, and I'm very pleased to say that this vest does exactly that. I'm 5'9 and 71kg, so I was a little unsure on whether to go for S or M, but since I'm trying to hit the 80kg mark, I decided to go for M which I'm pleased to say is a perfect fit. Overall I'd highly recommend this product from Myprotein. It's very comfortable, permits full range of motion in the shoulders and really does look the part. Thank you Myprotein for another brilliant product. 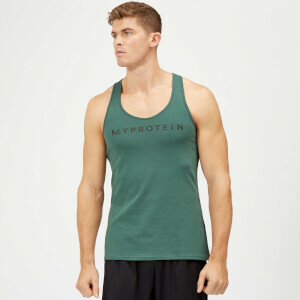 Ordered this fantastic stringer vest to get a little more freedom into my workouts, I'm 6ft on the dot,175lbs and this stringer in M is brilliant, I could not have asked for a better product, the material is very soft and comfortable on the skin and fits incredibly well. Not to mention the geo print is very smart looking, ideal for those wanting to make an effort with their gym gear! Another incredible product from Myprotein, I'll be continuing to purchase from here for all my workout needs.